Two brushed aluminum pendant lights. 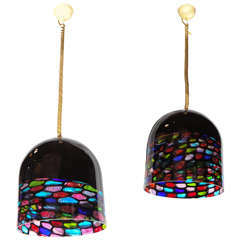 Set of four blush lilac Murano glass pendant lights. Each varying in length. Measure: 35 inches / 32 inches / 28 inches. 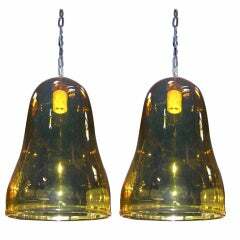 Pair of hand blown amber glass pendants. Bell shaped Glass. Glass section only measures 13 1/2\" tall. Any length wire and chain will be provided per client\'s requirements. 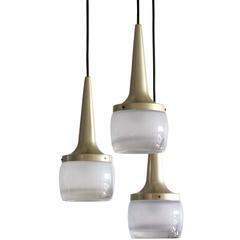 A pair of beautiful plaster pendant lights of circular shape, held by three adjustable brass chains. 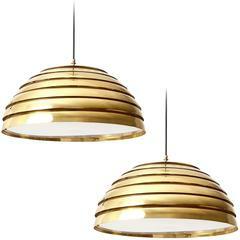 Pair of rattan dome pendants. Rattan domes are in good condition with new wiring. Dimensions: 17.5" diameter x 10" tall (to chain). 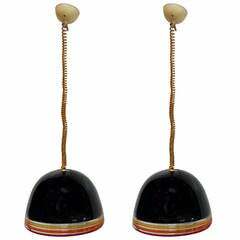 Two plastic pendant lights. 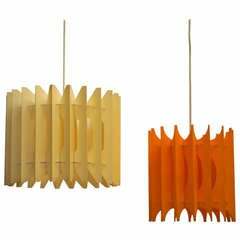 Dimensions orange lamp: Diameter 38 cm, height 30 cm. Dimensions white lamp: Diameter 28 cm, height 30 cm.